Daizaburo Edi-Ban, a Japanese-American, joins New York City's toughest precinct, the 34th. On his first day he is partnered up with John Estes, called Sleepy by his friends and Mad Bull by his enemies, a cop who stops crime with his own violent brand of justice. Mad Bull makes no qualms about executing common thieves with shotgun blasts if they even pose a minor threat to him or anyone around them. Mad Bull also often steals from prostitutes and does incredible amounts of property damage while fighting crime. 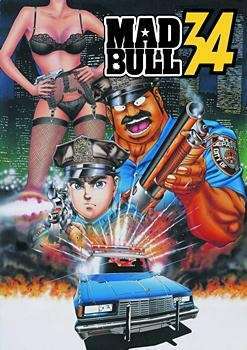 Mad Bull's unpoliceman-like behavior often puts him in hot water with his partner Daizaburo and the 34th precinct. However, despite how reckless or illegal these acts are, a good cause is always revealed . Perrine Valley, a police lieutenant, joins Daizaburo and Sleepy later on to help them tackle more difficult cases involving the mafia and drug-running.